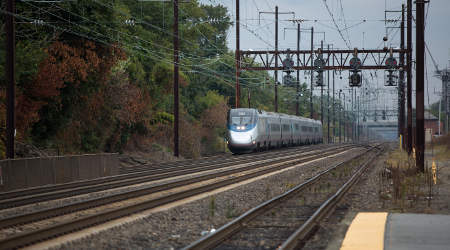 Amtrak would receive funding for its Northeast Corridor and national network under the new law. Amtrak, rail and transit programs, and $500 million for the U.S. Department of Transportation's Transportation Investment Generating Economic Recovery (TIGER) program. The bill was approved and signed by President Donald Trump to continue funding the federal government through Sept. 30, which is the end of fiscal-year 2017. The measure allows state departments of transportation and transit agencies to gain access to this year's scheduled funding increases that Congress had authorized and paid for under the 2015 Fixing America's Surface Transportation (FAST) Act. Those increases totaled about $400 million for transit programs and $1 billion for highway programs, which have been delayed since Oct. 1, the start of this budget year, according to the American Association of State Highway and Transportation Officials (AASHTO) Journal. • $1.85 billion for the Federal Railroad Administration, a $173 million increase above the FY2016 enacted level. The bill includes $98 million in rail grants to support positive train control (PTC) implementation, make rail infrastructure improvements and restore or enhance passenger-rail service. Amtrak will receive $328 million for the Northeast Corridor and $1.17 billion for its national network. Additionally, $258 million will go toward rail safety and research programs. • $12.4 billion for the Federal Transit Administration, including $9.7 billion for transit formula grants from the Highway Trust Fund. The measure provides $2.4 billion for Capital Investment Grants known as "New Starts"; fully funds all current Full Funding Grant Agreement (FFGA) transit projects; and supports new projects anticipated to receive FFGA awards. • $3 million for the National Surface Transportation and Innovative Finance Bureau, created by the FAST Act to consolidate several USDOT programs including TIFIA, RRIF and FASTLANE grants. The bill is "generally good news for the rail industry and rail contractors," according to a legislative alert from the National Railroad Construction & Maintenance Association (NRC). NRC reported that, in addition to continuing to funding all existing transit projects with existing FFGAs, the following projects could receive funding if they are able to sign new FFGAs: Maryland Purple Line, $125 million; Caltrain electrification, $100 million; Seattle's Lynnwood Link, $100 million; New York City Transit's Canarsie power improvements, $84 million; the streetcar program in Santa Ana, Calif., $50 million; Dallas Area Rapid Transit's core capacity project, $49 million; and the Minneapolis Southwest light-rail transit project, $10 million. Moreover, the legislation sets aside $408 million for 10 "small start" projects, NRC reported. Among those projects are four new streetcars in Tempe, Ariz., $50 million; Sacramento, Calif., $50 million; Fort Lauderdale, Fla., $11 million; and Seattle, $50 million. NRC's report also noted that the bill provided another $150 million in funding for the Washington Metropolitan Area Transit Authority; and $199 million for PTC funding for commuter railroads that was authorized under the FAST Act.